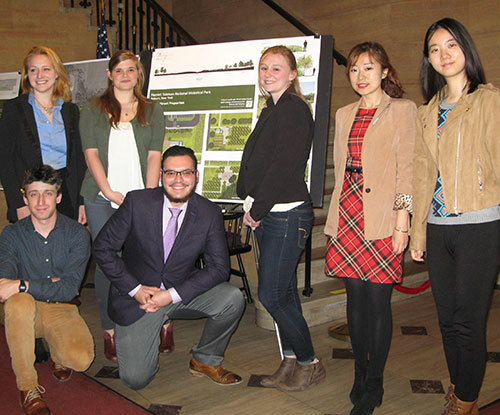 ESF landscape architecture and environmental and forest biology students connected the past with the present in a design studio where they developed a design plan for adapting the landscape of Harriet Tubman's home, church, gravesite and farm in Auburn, New York into a national historical park. Students in the Historic Preservation Thematic Studio spent the spring semester developing a design plan for the landscape of the newly designated national park unit. They familiarized themselves with Tubman's history and proposed ways to interpret that story for the public. The 32-acre park, which includes Tubman's brick house and frame Home for the Aged building on South Street along with her church on Parker Street, was officially designated as a national historical park Jan. 10, 2017, by former Secretary of the Interior Sally Jewell. Tubman, the famous abolitionist known as the Moses of her People for her work on the Underground Railroad, acquired a small farm in Auburn in 1859, and lived there following the Civil War until her death in 1913. One of her passions during this time was care of her family and aged African-Americans through her home and church, the African Methodist Episcopal Zion Church. The AME Zion Church has owned the South Street site since her death; and for the past three decades, it's been opened to the public by Harriet Tubman Home, Inc., during which time much of the site has changed from open farmland to successional woods. Currently the site doesn't have high national visibility. "It's off people's radar," said Richard Hawks, ESF Distinguished Service Professor in the ESF Department of Landscape Architecture (LA) and one of the instructors for the studio. However, with plans for Tubman to grace the $20 bill in 2020, it's expected Tubman's legacy - and her home - will enjoy a surge in national attention. The students - undergraduates in their final semester in the landscape architecture program and graduate students - explored design and planning issues related to adapting the landscape that was central to Tubman's life into a national park. They addressed issues including restoration of historic field patterns, visitor services and access, and interpretation, as well as how to connect the Tubman home site and Tubman's church, which is about a mile away. The studio culminated in a presentation to the Auburn City Council, National Park Service representatives and other community stakeholders. "Right now the site (landscape) has minimal interpretation and accommodations so we feel like there's some significant pressure to make things happen over the next year or two," said Hawks, "We're hoping the studio provided enough information to begin the process including foremost the siting of the new visitor's center." As part of their research, some of the students visited the newly opened Harriet Tubman Underground Railroad National Historical Park in Church Creek, Maryland. This is the area where Tubman was "born and lived until she emancipated herself in 1849," according to the National Park Services website. No original buildings from Tubman's life exist there. "That's why it's (the Auburn site) so important to people," said Hawks, "because her house exists." The students not only looked at the current landscape, but also delved into Tubman's history. "The students met with noted Tubman historian Kate Clifford Larson after reading her book, "Bound for the Promised Land: Harriet Tubman - Portrait of an American Hero." "Coming into the design studio I didn't expect the historic context to be as deep," said Paige Buzard, a fifth-year senior in the landscape architecture program. "We never went into detail when we studied Tubman in (elementary) school so it's been incredible to see what we can do with the land that's changed over time. We're kind of putting it back and able to teach people things that aren't generally known about Harriet Tubman," said Buzard. "While there has been considerable research on the buildings … the landscape has been granted minimal attention," said graduate student Jennifer Bushkie during a presentation to the Auburn City Council. To get a complete view of the landscape and its environs, the students turned to ESF's Department of Environmental and Forest Biology (EFB). An initial assessment of the site's natural resources was conducted last fall by Dr. Donald Leopold, EFB chair; Dr. James Gibbs, director of the Roosevelt Wild Life Station; and Sam Quinn, research assistant. Concurrent with the landscape architecture studio, Quinn's Senior Synthesis in Conservation Biology class addressed issues of natural resource management and developed land management plans for the park. "The class's efforts centered on natural resources," said Quinn, "both to inform the broader landscape alterations the landscape architecture students were proposing, such as siting new facilities, and to promote biodiversity in its own right." The LA students synthesized the collected information into six alternative design plans. That studio's preferred design involves turning the frame house that was used as Tubman's Home for the Aged into the park's visitor center and includes construction of an L-shaped addition to provide access for the disabled. The class also recommended building a barn-like structure on the grounds to host events such as astronomy shows, so visitors can learn how Tubman led people to freedom navigating by the North Star. The design also proposed restoring Tubman's farm, with plans for a fenced livestock area, garden and orchards. "These properties are the culmination of everything Harriet Tubman hoped - not only to escape slavery but to become self-sufficient and be in a position where she could take care of herself, her family and other people in need," said student Mikala Sherman, a fifth-year senior in the landscape architecture program. Throughout the process, students were also introduced to ESF's professional network. "What impressed me about this studio was how many connections ESF has out in the community," said Max Goodstein, a fifth-year senior in the landscape architecture program. "ESF has a cooperative agreement with the National Parks Service and I never knew that before this studio. There's also a relationship with the Olmsted Center (for Landscape Preservation) out of Boston and our professors have these relationships with planners and community members in the surrounding communities like Auburn. It's nice to work with that." Bringing those partners together was ESF's Center for Cultural Landscape Preservation (CCLP), based in the Department of Landscape Architecture. The CCLP, headed by George W. Curry, Distinguished Teaching Professor Emeritus and John Auwaerter, Historical Landscape Architect, brings together interdisciplinary expertise from across ESF, the National Park Service, state parks and other partners to address challenges in preserving landscape heritage. The studio's work at the Tubman site is informing the CCLP's research to develop a Cultural Landscape Report for the NPS, which will document the history, existing conditions, and significance of the landscape, and develop recommendations for its future management. The studio provided an opportunity to explore a wide range of concepts for the site's future. ESF is one of the few colleges offering cultural landscape preservation as a core part of its landscape architecture curriculum and has been doing so since the 1990s, noted Christine Capella Peters, co-instructor for the studio. "This studio in particular is a relatively unique offering for graduate and undergraduate students who are interested in cultural landscape preservation and hopefully it's the first of a number of thematic studios that will deal with properties like this," she said. Frank Barrows, superintendent at Fort Stanwix National Monument, is the project lead for Harriet Tubman National Historical Park. In an interview with The Citizen newspaper in April, Barrows said the park currently has no operating budget and is "probably five years out." The students' designs will form the basis for the treatment recommendations in the Cultural Landscape Report that will be developed collaboratively with the CCLP, NPS, and Harriet Tubman Home Inc., along with the larger community in Auburn. Said Hawks, "We hope the studio will result in an increased understanding of how the landscape can enrich the interpretation of Tubman's story."